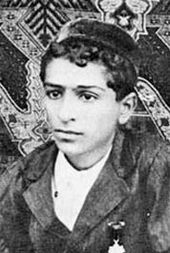 Merwan Sheriar Irani was born in 1894 in Pune, India, to Irani Zoroastrian parents. His spiritual transformation began when he was 19 years old and lasted for seven years. During this time he contacted five spiritual teachers before beginning his own mission and gathering his own disciples in early 1922, at the age of 27. From 10 July 1925 to the end of his life, Meher Baba maintained silence, communicating by means of an alphabet board or by unique hand gestures. With his mandali (circle of disciples), he spent long periods in seclusion, during which time he often fasted. He also traveled widely, held public gatherings and engaged in works of charity with lepers and the poor. In 1931, Meher Baba made the first of many visits to the West, where he attracted followers. Throughout most of the 1940s, Meher Baba worked with a category of spiritual aspirants called masts, whom he said are entranced or spellbound by internal spiritual experiences. Starting in 1949, along with selected mandali, he traveled incognito about India in an enigmatic and still largely unexplained period he called the "New Life". After being injured as a passenger in two serious automobile accidents, one in the United States in 1952 and one in India in 1956, his ability to walk became severely limited. In 1962, he invited his Western followers to India for a mass darshan called "The East–West Gathering". Concerned by an increasing use of LSD and other psychedelic drugs, in 1966 Baba stated that they did not convey real benefits. Despite deteriorating health, he continued what he called his "Universal Work", which included fasting and seclusion, until his death on 31 January 1969. His samadhi (shrine/tomb) in Meherabad, India, has become a place of international pilgrimage. Meher Baba gave numerous teachings on the cause and purpose of life, including teaching reincarnation and that the phenomenal world is an illusion. He taught that the Universe is imagination, that God is what really exists, and that each soul is really God passing through imagination to realize individually his own divinity. In addition he gave practical advice for the aspirant who wishes to attain God-realization and thereby escape the wheel of births and deaths. He also taught about the concept of Perfect Masters, the Avatar, and those on the various stages of the spiritual path that he called involution. His most important teachings are recorded in his principal books Discourses and God Speaks. His legacy includes the Avatar Meher Baba Charitable Trust he established in India, a handful of centers for information and pilgrimage, as well as an influence on pop-culture artists and the introduction of common expressions such as "Don't Worry, Be Happy." Meher Baba's silence has remained a mysterious issue as much among his followers as with the rest of the world. Meher Baba was an Irani born in Pune, India, to a Zoroastrian family. His given name was Merwan Sheriar Irani. He was the second son of Sheriar Irani, a Persian Zoroastrian who had spent years wandering in search of spiritual experience before settling in Poona (now Pune), and Shireen Irani. As a boy, he formed the Cosmopolitan Club, which was dedicated to remaining informed in world affairs and donating money to charity. He was a multi-instrumentalist and poet. Fluent in several languages, he was especially fond of the poetry of Hafez, Shakespeare, and Shelley. In his youth, he had no mystical inclinations or experiences, and was "[u]ntroubled as yet by a sense of his own destiny..." He was more interested in sports and was co-captain of his high school cricket team. At the age of 19, during his second year at Deccan College in Pune, he met an ancient Muslim woman, locally revered as a saint, named Hazrat Babajan, who kissed him on the forehead. The event affected him profoundly and left leaving him visibly dazed. He gave up his normal activities. After that he contacted other spiritual figures, who, along with Babajan, he later said were the five "Perfect Masters" of the age, namely Tajuddin Baba, Narayan Maharaj, Sai Baba of Shirdi, and Upasni Maharaj. Upasni Maharaj, he later said, helped him to integrate his mystical experiences with normal consciousness, thus enabling him to function in the world without diminishing his experience of God-realization. In late 1921, at the age of 27, after living for seven years with Upasni, Merwan began to attract a following of his own. His early followers gave him the name Meher Baba (Compassionate Father). In 1922, Meher Baba and his followers established Manzil-e-Meem (House of the Master) in Bombay (now Mumbai). There, Baba commenced his practice of demanding strict discipline and obedience from his disciples. A year later, Baba and his mandali moved to an area a few miles outside Ahmednagar that he named Meherabad (Meher flourishing). This ashram would become the center for his work. During the 1920s, Meher Baba opened a school, hospital and dispensary at Meherabad., all three free and open to all castes and faiths. From July 1925 onwards, Meher Baba initiated a life-long period of self-imposed silence, which would last forty-four years, until the end of his life. He now communicated by use of chalk and slate, then by an alphabet board and later via self-styled hand gestures. In January 1927 he gave up writing with pen or pencil also. In the 1930s, Meher Baba began a period of extensive world travel and took several trips to Europe and the United States. It was during this period that he established contact with his first close group of Western disciples. He traveled on a Persian passport because he had given up writing as well as speaking and would not sign the forms required by the British government of India. On his first trip to England in 1931, he traveled on the SS Rajputana, the same ship that was carrying Mahatma Gandhi, who was sailing to the second Round Table Conference in London. Baba and Gandhi had three meetings onboard, one of which lasted for three hours. The British press publicized these meetings, but an aide to Gandhi said, "You may say emphatically that Gandhi never asked Meher Baba for help or for spiritual or other advice." On 20 May 1932, Baba arrived in New York and provided the press with a 1000 word written statement, which was described by devotee Quentin Tod as his "Message to America". In it, Baba proclaimed himself "one with the infinite source of everything" and declared his intention to break his silence. "When I speak, my original message will be delivered to the world and it will have to be accepted." When asked about the Indo-British political situation he had no comment, but his followers explained that he had told Gandhi to abandon politics. In the West, Meher Baba met with a number of celebrities and artists, amongst them Gary Cooper, Charles Laughton, Tallulah Bankhead, Boris Karloff, Tom Mix, Maurice Chevalier, Ernst Lubitsch and others. On 1 June 1932, Mary Pickford and Douglas Fairbanks, Jr. held a reception for Baba at Pickfair at which he delivered a message to Hollywood. 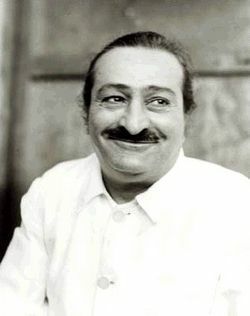 As a result, Meher Baba emerged as "one of the enthusiasms of the '30s". In 1934, after announcing that he would break his self-imposed silence in the Hollywood Bowl, Baba changed his plans abruptly and boarded the RMS Empress of Canada and sailed to Hong Kong without explanation. The Associated Press reported that "Baba had decided to postpone the word-fast breaking until next February because 'conditions are not yet ripe'." He returned to England in 1936 but did not return to the United States again until the early 1950s. In the late 1930s, Meher Baba invited a group of Western women to join him in India, where he arranged a series of trips throughout India and Sri Lanka (then known as Ceylon) that became known as the Blue Bus Tours. When the tour returned home, many newspapers treated their journey as an occasion for scandal. Time Magazine's 1936 review of God is my Adventure describes the US's fascination with the "long-haired, silky-mustached Parsee named Shri Sadgaru [sic] Meher Baba" four years earlier. In the 1930s and 1940s, Meher Baba worked extensively with masts, persons "intoxicated with God". According to Baba, these individuals are disabled by their enchanting experience of the higher spiritual planes. Although outwardly masts may appear irrational or insane, Baba claimed that their spiritual status was elevated, and that by meeting with them he helped them to move forward spiritually while enlisting their aid in his spiritual work. One of the best known of these masts, known as Mohammed Mast, lived at Meher Baba's encampment at Meherabad until his death in 2003. In 1949 Baba began an enigmatic period that he called the New Life. Following a series of questions on their readiness to obey even the most difficult of his requests, Baba selected twenty companions to join him in a life of complete "hopelessness and helplessness". He made provisions for those dependent on him, after which he and his companions otherwise gave up nearly all property and financial responsibilities. They traveled about India incognito while begging for food and carrying out Baba's instructions in accordance with a strict set of "conditions of the New Life". These included absolute acceptance of any circumstance and consistent good cheer in the face of any difficulty. Companions who failed to comply were sent away. This New Life is endless, and even after my physical death it will be kept alive by those who live the life of complete renunciation of falsehood, lies, hatred, anger, greed and lust; and who, to accomplish all this, do no lustful actions, do no harm to anyone, do no backbiting, do not seek material possessions or power, who accept no homage, neither covet honor nor shun disgrace, and fear no one and nothing; by those who rely wholly and solely on God, and who love God purely for the sake of loving; who believe in the lovers of God and in the reality of Manifestation, and yet do not expect any spiritual or material reward; who do not let go the hand of Truth, and who, without being upset by calamities, bravely and wholeheartedly face all hardships with one hundred percent cheerfulness, and give no importance to caste, creed and religious ceremonies. This New Life will live by itself eternally, even if there is no one to live it. Meher Baba ended the New Life in February 1952 and once again began a round of public appearances throughout India and the West. In the 1950s, Baba established two centers outside of India, namely the Meher Spiritual Center in Myrtle Beach, South Carolina in the United States and Avatar's Abode near Brisbane, Australia. He inaugurated the Meher Spiritual Center in April 1952. On 24 May 1952, en route from the Spiritual Center to Meher Mount in Ojai, California, the car in which he was a passenger was struck head-on near Prague, Oklahoma. He and his companions were thrown from the vehicle and suffered many injuries. Baba's leg was severely broken and he sustained facial injuries which included a broken nose. The injured were treated at Duke Hospital in Durham, North Carolina, after which they returned to Myrtle Beach to recuperate. While recuperating at Youpon Dunes, a home owned by Elizabeth Patterson, in Myrtle Beach, he worked on the charter for a group of Sufis, which he named Sufism Reoriented. Meher Baba began dictating his major book, God Speaks, The Theme of Creation and Its Purpose, using an alphabet board in Dehradun, August 1953. In September of 1954, Meher Baba gave a men-only sahavas at Meherabad that later became known as the Three Incredible Weeks. During this time Baba issued a declaration, "Meher Baba's Call", wherein he once again affirmed his Avatarhood "irrespective of the doubts and convictions" of others. At the end of this sahavas Meher Baba gave the completed manuscript of his book God Speaks to two members of Sufism Reoriented, Ludwig H. Dimpfl and Don E. Stevens, for editing and publication in America. The book was subsequently published by Dodd, Mead and Company the following year. On 30 September 1954 Meher Baba gave his Final Declaration message, in which he made enigmatic predictions. In October 1954, Meher Baba discarded his alphabet board and began using a unique set of hand gestures to communicate, which he used for the remainder of his life. On 2 December 1956, outside Satara, India, the car in which Baba was being driven went out of control and a second serious automobile accident occurred. Baba suffered a fractured pelvis and other severe injuries. Dr. Nilu, one of Baba's mandali, was killed. This collision seriously incapacitated Baba. Despite his physicians' predictions to the contrary, Baba began to walk again after great effort, but from that point on he was in constant pain and was severely limited in his ability to move. During his trip to the West in 1958 he often needed to be carried from venue to venue. In 1956, during his fifth visit to the US, Baba stayed at New York's Hotel Delmonico before traveling to the Meher Center at Myrtle Beach, South Carolina. In July he traveled to Washington, D.C. and received friends and disciples at the home of Mrs. James Terry (Ivy) Duce, wife of the vice-president of the Arabian American Oil Co. He then traveled to Meher Mount at Ojai, California before continuing on to Australia. His final visits to the United States and Australia were made in 1958. In 1962, Baba gave one of his last public functions, a series of meetings he called The East-West Gathering. At these meetings, at which his western followers were invited to meet his Indian disciples, Baba gave darshan to many thousands of people despite the physical strain this caused him. In the mid-1960s Baba became concerned with the drug culture in the West and began correspondences with several Western academics, including Timothy Leary and Richard Alpert, in which he discouraged the use of hallucinogenic drugs for spiritual purposes. In 1966 Baba's responses to questions on drugs were published in a pamphlet titled God in a Pill? Meher Baba stated that drug use was spiritually damaging and that if enlightenment were possible through drugs then "God is not worthy of being God". Meher Baba instructed his young Western disciples to spread this message; in doing so, they increased awareness of Meher Baba's teachings. In an interview with Frederick Chapman, a Harvard graduate and Fulbright scholar who met Baba during a year of study in India, Baba described LSD as "harmful physically, mentally and spiritually", and warned that "[its continued use] leads to madness or death". An anti-drug campaign was initiated by Baba lovers in the United States, Europe and Australia. The campaign was mostly futile, but won Baba new followers, and some of Baba's views found their way into academic debate on the merits and dangers of hallucinogens. From the East-West Gathering of 1962 onward, Baba's health deteriorated. Despite the physical toll it took on his body, he continued to undergo periods of seclusion and fasting. In late July 1968, Baba completed a particularly taxing period of seclusion and stated that by then his work was "completed 100% to my satisfaction". He was by then using a wheelchair. Within a few months, his condition had worsened and he was bedridden, wracked by muscle spasms that had no clear medical origin. Despite the care of several doctors the spasms worsened. On 31 January 1969, Meher Baba died at his home in Meherazad. He conveyed by his last gestures, "Do not forget that I am God." In time, his devotees called the anniversary of his death Amartithi (deathless day). Meher Baba's body lay in state at his samadhi at Meherabad. Covered with roses, and cooled by ice, his body was kept available to the public for one week before its final burial. Prior to his death, Meher Baba had made extensive preparations for a public darshan program to be held in Poona. His mandali decided to proceed with the arrangements despite the absence of the host. Several thousand attended this "Last Darshan," including many hundreds from the United States, Europe, and Australia. Man's inability to live God's words makes the Avatar's teaching a mockery. Instead of practicing the compassion he taught, man has waged wars in his name. Instead of living the humility, purity, and truth of his words, man has given way to hatred, greed, and violence. Because man has been deaf to the principles and precepts laid down by God in the past, in this present Avataric form, I observe silence. Meher Baba often signaled the moment "that he would 'break' his silence by speaking the 'Word' in every heart, thereby giving a spiritual push forward to all living things". According to him, the breaking of his silence would be a defining event in the spiritual evolution of the world. On many occasions Meher Baba promised to break his silence with an audible word before he died, often stating a specific time and place when this would occur, but according to all contemporary accounts, Meher Baba remained silent until his death. His failure to break his silence disappointed some of his followers, while others regarded these broken promises as a test of their faith. A number of his followers speculate that "the Word" will yet be "spoken" or that Meher Baba broke his silence in a spiritual rather than a physical way. Baba, for many years, asked his followers to undertake austerities on 10 July, the anniversary of the day his silence began, such as keeping silence, fasting and praying. In his final Silence Day request to his followers in 1968, he asked only that they keep silent. Many followers continue to celebrate Silence Day by keeping silence in his honor. Meher Baba's teachings can roughly be divided into two main categories: his metaphysics on the nature of the soul and the Universe, and practical advice for the spiritual aspirant. The two are interrelated. His metaphysics is mostly found in his principal book on the subject, God Speaks. It contains detailed statements on his cosmology and the purpose of life as well as the progression of the soul, while his elucidations on the practical spiritual life are mostly contained in Discourses, although it also covers many metaphysical areas mirroring or amplifying God Speaks. In God Speaks, Meher Baba describes the journey of the soul from its original state of unconscious divinity to the ultimate attainment of conscious divinity. The whole journey is a journey of imagination, where the original indivisible state of God imagines becoming countless individualized souls which he likens to bubbles within an ocean of infinite size. Each soul, powered by the desire to become conscious, starts its journey in the most rudimentary form of consciousness. This limitation brings the need of a more developed form to advance it towards an increasingly conscious state. Consciousness grows in relation to the impressions each form is capable of gathering. According to Baba, each soul pursues conscious divinity by evolving, that is, experiencing itself in a succession of imagined forms through seven "kingdoms" of stone/metal, vegetable, worm, fish, bird, animal, and human. The soul identifies itself with each successive form, becoming thus tied to illusion. During this evolution of forms, the power of thought increases, until in human form thought becomes infinite. Although in human form, the soul is capable of conscious divinity, all the impressions that it has gathered during evolution are illusory ones that create a barrier against the soul knowing itself. For this barrier to be overcome, further births in human form are needed in a process known as reincarnation. The soul will reach a stage where its previously gathered impressions grow thin or weak enough that it enters a final stage called involution. This stage also requires a series of human births, during which the soul begins an inner journey, by which it realizes its true identity as God. Baba breaks this inner journey of Realization into seven stages he called "planes." The process culminates, at the seventh plane, with God-realization, at which the goal of life for the soul is reached. The Discourses are a collection of explanations and elucidations that Meher Baba has given on many topics that concern the advancement of the spiritual aspirant. Some of the most important topics treated are: sanskaras (mental impressions), Maya (the principle of illusion), the nature of the ego, reincarnation, karma, violence and non-violence, meditation, love, discipleship, and God-realization. His explanations often include stories from the lore of India and the Sufi culture. One such story, the wise man and the ghost, shows the power that superstitious beliefs can have on a person, while another, Majnun and Layla, show how selfless love, even in human relations, can lead one to discipleship. Thus Meher Baba offers many suggestions that keep one moving towards God-realization. These suggestions include putting theory into practice, the internal renunciation of desires, offering selfless service to humanity or the master, spontaneity, while avoiding actions that bind one to illusion. But rather than lay out moral rules, Baba offers an understanding as to why some actions bind the individual whereas some others help towards his emancipation. Many chapters offer a better understanding of the mechanisms by which consciousness gets caught up between the opposites of experience, such as pleasure and pain, good and evil, and point to a way of transcending them. Baba related that there are 56 incarnate God-realized souls on Earth at any given time. Of these souls there are always five who constitute the five Perfect Masters of their era. When one of the five Perfect Masters dies, according to Baba, another God-realized soul among the 56 would replaces him or her at once. The Avatar, according to Baba, is a special Perfect Master, the first soul to achieve God-realization. This soul, the original Perfect Master, or Ancient One, never ceases to incarnate. Baba indicated that this particular soul personifies the state of God called Vishnu in Hinduism and Parvardigar in Sufism, i.e. the sustainer or preserver state of God. The Avatar, in Baba's testimony, appears on Earth every 700–1400 years and is "brought down" into human form by the five Perfect Masters of the time to aid in the process of moving creation in its never-ending journey toward Godhood. Baba claimed that in other ages this role had been fulfilled by Zoroaster, Rama, Krishna, Buddha, Jesus, and Muhammad. Baba described the Avatar as "a gauge against which man can measure what he is and what he may become. He trues the standard of human values by interpreting them in terms of divinely human life." The majority of Meher Baba's followers accept his claim of avatarhood and he is said to be "revered by millions around the world as the Avatar of the age and a God-realized being". Baba's travels and teachings left a legacy of followers and devotees worldwide. The Avatar Meher Baba Charitable Trust, established by Meher Baba in 1959, maintains his tomb and pilgrimage facilities, as well as a free school and dispensary, a cataract clinic, and a veterinary clinic. The Trust follows the charter left for it by Meher Baba in his lifetime, but does not act as spiritual authority over groups. Likewise, the Trust does not engage in propaganda, promote creeds or dogmas, or seek converts. Baba discouraged evangelizing, stating, "I need no propaganda or publicity." Rather, he encouraged his followers to "let your life itself be my message of love and truth to others" and to "spread my message of Love and Truth as far and wide as possible". Followers of Meher Baba have no established rituals. Many do, however, perform practices of choice such as pujas, aartis, prayers, music, plays, viewing films of Baba and so forth, but the choice is personal. The primary focus for followers is living a life Meher Baba would approve of, for example, refraining from the use of psychedelic drugs, including marijuana, and trying to remember God with love. Gatherings of Baba followers are generally informal. Special effort is made to gather together on Amartithi, the anniversary of Baba's death, and on his birthday. Many Baba followers keep silent on 10 July (Silence Day), observing the request Baba frequently made of his followers during his lifetime. Aarti is performed morning and evening at Baba's samadhi in India. Also at Meherabad, his followers maintain Baba's practice of lighting a dhuni fire on the 12th of each month. Although Baba had initially begun gaining public attention in the West as early as 1932 as the result of contacts with some celebrities of the time and from the rather disillusioned account of Paul Brunton (A Search in Secret India, 1934), he received further attention after his death through various mentions in western pop-culture. Pete Townshend of The Who, who became a follower of Baba, dedicated his 1969 rock-opera Tommy to Meher Baba in the record's gatefold. The Who's 1971 song "Baba O'Riley" was named in part after Meher Baba, and Townshend recorded several Meher Baba tribute albums including Happy Birthday, I Am, Who Came First, and With Love. In 1970 Melanie Safka mentioned Baba in her song "Lay Down (Candles in the Rain)" with the lyrics "Meher Baba lives again". Bobby McFerrin's 1988 Grammy Award-winning song "Don't Worry, Be Happy" was inspired by a popular quote of Baba seen in numerous Baba posters and inspirational cards. Concepts of Meher Baba's philosophy, as well as a character based on Baba but unnamed, have also frequently appeared in works of comic book writer J. M. DeMatteis, including Doctor Fate and Seekers Into The Mystery. In 2012, the feature film Nema Aviona za Zagreb premiered in the Netherlands with an exclusive interview with Meher Baba filmed in 1967. In the interview Baba explains the difference between God-realization and drug-induced hallucinations and the scene plays a pivotal role in the documentary's narrative. ^ Brecher, Edward M; et al. (1972). "How LSD was popularized". Consumer Reports/Drug Library. Retrieved 14 July 2008. ^ Purdom (1964) p. 407 – "Why he ceased to speak and write Baba has explained only vaguely, though much natural curiosity is aroused; the first question asked when people come to know about him or to see him is why he does it. That both silence and nonwriting are of great significance is certain; not surprisingly Baba does not explain. Silence is the answer to silence." ^ In an Indian context, an Irani is a member of one of two groups of Zoroastrians of that subcontinent, the other being the Parsis. They are called Iranis by other Indians because they spoke an Iranian language. "Those who left Iran soon after the advent of Islam to escape persecution, reached the shores of Gujarat 1,373 years ago. Their descendants are the Parsis. While the Zoroastrians who migrated to India from Iran relatively recently — 19th century onwards — are called Irani Zoroastrians." (quote from Padmaja Shastri,TNN, "What sets Zoroastrian Iranis apart", The Times of India, 21 March 2004. Retrieved 11 July 2008). ^ Sutcliffe (2002); p. 38. ^ Purdom (1964) p. 95. ^ Landau, Rom: "God Is My Adventure", Faber & Faber, London, 1936. p. 111. ^ "Meher Baba Hopes to Elevate People Here to "Infinite State" He Enjoys. He Will Establish Spiritual Retreat at Harmon, N.Y., and Seek to Break Religious Barriers". The New York Times. Associated Press. 26 March 1932. ^ "Men, Masters & Messiahs". Time Magazine. 20 April 1936. Retrieved 26 June 2008. ^ Awakener Magazine, Vol. 10, No. 2, pp. 38–39 "Heroines of the Path, Part 7C". Retrieved 25 June 2008. ^ Man hasn't spoken in 31 years, Big Spring Daily Herald, 30 June 1957 Note: this article identifies the visit as Meher Baba's 10th US visit, and places the planned date as July 1957, not 1956 as generally accepted. ^ Kalchuri (1986) p. 738 "Meher Baba had observed silence three times before, but the silence beginning July 10th, 1925, was to last until the end of his life." ^ Meher Baba. "The Universal Message". Avatar Meher Baba Perpetual Public Charitable Trust. Retrieved 16 December 2013. ^ Ullman, Robert; Judyth Reichenberg-Ullman (2001). Mystics, Masters, Saints, and Sages. RedWheel / Weiser. ISBN 1-57324-507-0. page 125. ^ See for example: Kalchuri (1986), pp. 900, 915, 5648, 5655, 5787, 5807, 6015, 6024, 6027, 6037, 6105, 6061, 6090, 6151, 6166, 6170, 6172, 6206, 6164, 6318, 6319, 6341, 6370,, 6425, 6532, 6548, 6579, etc. ^ Two close disciples have reported hearing Baba speak or make sounds in the days preceding his death. In 1992, Eruch Jessawala, a close disciple of Meher Baba, recalled that "a few days before Meher Baba dropped his body [...]Meher Baba had covered his mouth with his hand and shouted with great intensity:...'Mmmmmmm!'" [Glow International, May 1992, pp. 13-18]. Similarly, Bhau Kalchuri recalled in 2001 "Baba actually spoke two words to Bhau: 'Yad rakh [remember this]!' and then gestured, 'I am not this body!'[... ]'Although Baba's voice was feeble,' Bhau recalled, 'the sound was audible and clear, and its intensity and impact very, very forceful. It conveyed so great an impression, that my mind itself neither registered nor questioned the fact that Baba was speaking." [see Kalchuri, Bhau (2005). Lord Meher. Volume 8 (Second (India) ed.). Meher Mownavani Publications. p. 4765. ] although this recollection contradicted his own earlier accounts [see Kalchuri (1986) p. 6710] and Kalchuri later clarified those recollections, saying that actual words had not been spoken [Glow International, Spring 2012, page 3]. ^ Glimpses of the God-Man, Meher Baba, vol. 6, by Bal Natu, Sheriar Foundation, 1994, p. 77 – "I want all my lovers to observe complete silence for twenty-four hours, from midnight of July 9th to midnight of July 10th, 1968." ^ God Speaks, Revised 2nd edition, 1997, pp. 8–27. ^ Discourses, 7th edition, 1987, pp. 5, 42, 46, 53, 62, 65, etc. ^ Discourses, 7th edition, 1987, pp. 26, 61, etc. ^ New Religious Movements in the United States and Canada: A Critical Assessment and Annotated Bibliography. Contributors: Diane Choquette – compiler. Publisher: Greenwood Press. Place of Publication: Westport, CT. Publication Year: 1985. Page Number: 12. ^ Avatar Meher Baba Trust Website "Meher Baba never wanted nor encouraged propaganda. The Trust does not, accordingly, work to promote creeds or dogmas, nor does it seek "converts"." ^ Baba, Meher (1954): "What Baba Means by Real Work", Universal Spiritual League in America, Inc.
^ Purdom (1964) p. 282. ^ Kalchuri (1986) pp. 5476, 4933, 5609, 6465, 2294, 3179, 3864, etc. ^ Draaiboek, Nema Aviona Za Zagreb, Een film van Louis van Gasteren, Eeen Spectrum Film Publicatie, (2012), pp. 18-19. Abdulla, Ramjoo (1979). Ramjoo's Diaries, 1922–1929: A Personal Account of Meher Baba's Early Work. Sufism Reoriented. Baba, Meher (1987). Discourses (7th edition). Myrtle Beach, S.C.: Sheriar Foundation. ISBN 1-880619-09-1. Baba, Meher (2007). Discourses (rev 6th edition). Myrtle Beach, S.C.: Sheriar Foundation. ISBN 1-880619-34-2. Baba, Meher (1966). God in a Pill? Meher Baba on L.S.D. and The High Roads. Sufism Reoriented, Inc.
Baba, Meher (1997). God Speaks. Walnut Creek, California: Sufism Reoriented. ISBN 0-915828-02-2. Baba, Meher (1989). Silent Master. Spartacus Educational Publishers. ISBN 0-948867-25-6. Choquette, Diane (1985). New religious movements in the United States and Canada: a critical assessment and annotated bibliography. Westport, Conn: Greenwood Press. ISBN 0-313-23772-7. Donkin, William (2001). The Wayfarers: Meher Baba with the God-Intoxicated. Myrtle Beach, S.C.: Sheriar Foundation. ISBN 1-880619-24-5. Ellwood, Robert S. (1973). Religious and Spiritual Groups in Modern America. New York: Prentice-Hall. ISBN 0-13-615641-X. Kalchuri, Bhau (1982). The Nothing and the Everything. Manifestation, Inc. ISBN 0-932947-02-6. Kalchuri, Bhau (1986). Meher Prabhu: Lord Meher, The Biography of the Avatar of the Age, Meher Baba. Manifestation, Inc.
Landau, Rom (1972). God is my adventure; a book on modern mystics, masters, and teachers. Freeport, N.Y.: Books for Libraries Press. ISBN 0-8369-2848-2. Purdom, Charles B. (1964). The God-Man: The Life, Journeys & Work of Meher Baba with an Interpretation of His Silence & Spiritual Teaching. London: George Allen & Unwin. ISBN 1-880619-36-9. Sutcliffe, Steven J. (2002). Children of the New Age: A History of Alternative Spirituality. London: Routledge.